The picture above was taken in 2006 at the home of Hanoch Daum, an Israeli journalist and writer, who celebrated his birthday with the presence of two distinguished guests: Opposition leader Benjamin Netanyahu and TV anchor and journalist Yair Lapid. "At the end of a long night, at 2:30 in the morning, I sat in my chair and I felt some hope," writes Hanoch Daum at the start of his article in Yediot's 7 days magazine. "At that point, the thought that came to my mind was completely disengaged from reality: Benjamin Netanyahu and Yair Lapid will work one day together, and even handle it well... In my living room that long night something in the free atmosphere made me see that these two have much in common. Much more on what they agree on than what to argue about," he writes. On his 30th Birthday, Hanoch Daum decided to add two prominent Israelis to his inner circle, called 'Shuvi Nafshi" - a regular gathering that was assembled by Religious media personals who felt as outsiders at their job. Netanyahu was at the time the opposition leader and head of a shrunk 12 seat Likud Party, and Yair Lapid was a TV anchor, fellow journalist and publisher of Daum's first autobiography "Elohim Lo Marshe" (God does not allow). Netanyahu spoke of how concerned he is about the Iranian nuclear. When asked by Daum why he's making all of us worried, he turned around and asked: 'What do you propose, Hanoch. That I shouldn't let people know that we could end up with a nuclear Iran?' Lapid, spoke about a different topic, which wasn't relatively popular at the time, of how to improve the present. While Lapid was speaking of the struggling middle class, education and the equal share of burden, "I noticed," writes Daum, "that Netanyahu, when seated next to Lapid, is a different person. He was calmer and more appeased." "Netanyahu and Lapid sat on the white couch. I looked at them. This was their first intimate and comprehensive dialogue, not in a form of an interview or a formal briefing. They really spoke to one another," Daum describes. "Not on everything they agreed upon, but there was some civility in their conversation." "The meeting between Lapid and Netanyahu that went on till 2:15 in the morning, was a defining moment in which I came to believe that it's possible. That moment becomes even more relevant today: There'll be a lot of arguments between the two of them. They might both try to pull to different directions, but there will be understandings between them too. And there will be mutual ambition to change," Daum writes. "Lapid will redeem Netanyahu from stagnation. He will lead him to pursue change. 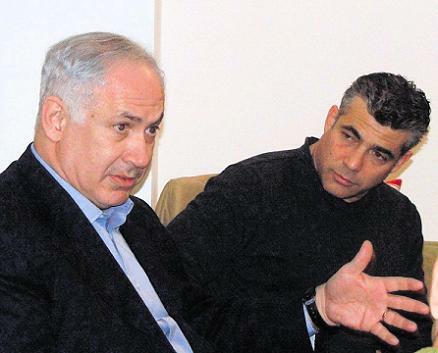 Lapid's presence in the government will also purify Netanyahu among audiences that never accepted him. On the other hand, Netanyahu will quickly discover that Lapid is a good guy. He doesn't lie or manipulate. He doesn't come crooked." "The alliance between Lapid and Netanyahu will help both of them," Daum concludes. Adding that their partnership "will be very helpful for the State of Israel. And its not something one is making up right now. It's something that I felt back then at 2:30 in the morning, when the guests left to their homes."